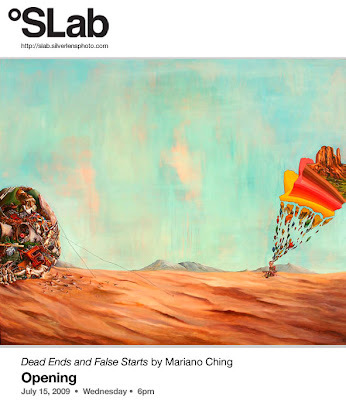 SLab proudly presents Dead Ends and False Starts by Mariano Ching, a series of work in an array of materials—of acrylic paintings on paper, canvas and metal signages. In this show, he depicts a dreamer and his desire for utopia in a post-apocalyptic world and presents a silver lining despite decay and obsolescence. Ching transports us to a manmade wasteland, set in a dystopic world. He creates meticulously detailed tableau-like Mounds of discarded things—from rubble, brick and bones to old tires, TV sets and video games. These Mounds are piled in neat layers, monuments that pay homage to the detritus' previous meaning and purpose. He also introduces Moles, a series of drawings of decaying people spewing rainbows, some projecting visions of greener pastures and some bleeding the objects they hold on to. They are living zombies, empty and without purpose only left with a vision of utopia. He builds a commentary on consumption and wastage, how we in effect create or destroy our own world. Ching leaves us open-ended without a solution or an ending to the narrative but with a glimmer of optimism. Dead Ends and False Starts by Mariano Ching will be shown alongside Sundance by Kawayan de Guia, Neal Oshima, Allan Razo and Julius Clar at Silverlens Gallery and Land of Promise by Gail Vicente and Marija Vicente at 20Square Gallery.